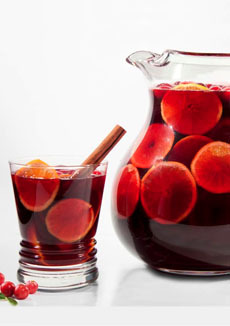 December 20th is National Sangria Day. The word derives from the Spanish word for bloodletting, and refers to the red wine that was used as a base for the punch. Around 200 B.C.E., the conquering Romans arrived in Spain and planted vineyards. They soon discovered that red grape varietals produced the best wine in the local soils. While some was enjoyed locally, the majority of the wines were shipped to Rome. The locals created fruit punches from the wines, and called these drinks sangria after the color. While sangria was drunk in Spain for more than 1,000 years, it didn’t arrive in the U.S. until 1964—at the Spanish Pavilion at the World’s Fair in New York. It was quickly adopted by Americans. In Spain, sangria is typically made with Rioja or another local red wine. There are white wine versions, called sangria blanco (white sangria) and sparkling versions using cava, sparkling white wine. This version adds Port to the red wine. Photo courtesy Sandemans. Ideally, the sangria—without the soda water—should be allowed to chill overnight for the flavors to meld. The chilled soda water should be added right before serving. 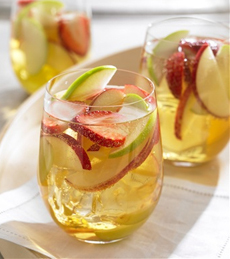 To serve, pour the sangria into a pitcher filled with ice cubes and garnish with more fresh fruit. Traditional sangria pitchers have a pinched lip so that the fruit and other solids do not splash into the glass. But if you’re going to purchase a pitcher, we particularly like a pitcher with a central well to hold the ice. This keeps the drink cold without diluting it. Since January 2014, the use of the word “sangria” on bottle labels is restricted by the European Union. Only sangria made in Spain and Portugal can be sold under that name. Sangaree, a fruit and wine punch from the West Indies, is the same drink. The name is an archaic English term for sangria.